When the Porsche Boxster arrived on the scene in 1997, it brought Porsche ownership to a lower price point. After the disappearance of the 924 after the 1988 model year, the lineup was left with the 944/968 as its entry level model, and at the close of 1995, the 968 and itâ€™s larger, front engined brethren, the 928, left the scene, leaving the 911 as the sole carrier of the Porsche torch. 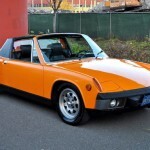 There has been some talk about a small, sub $40,000 Porsche roadster appearing in the near future, possibly with a flat four engine. How low will Porsche go, though, in attempting to reach new markets. 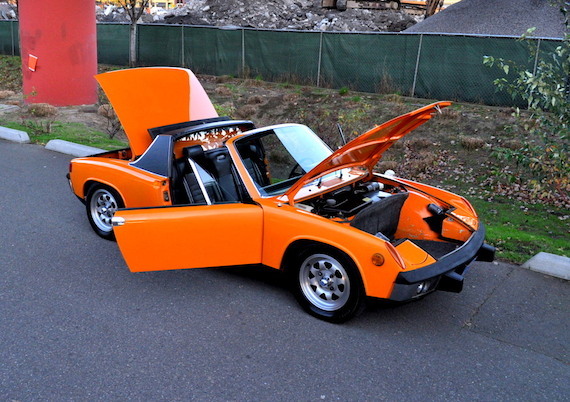 I never gave the 914 much of a second glance over the years, but these mid-engined targas are endearing in their own right, loved for their simplicity. 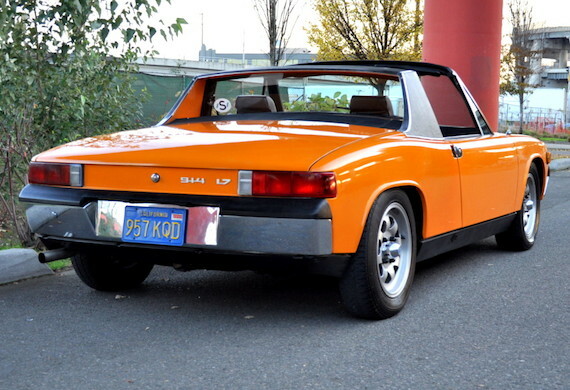 This orange 914 for sale in Portland, Oregon was stored away for many years but has been resurrected, ready for a new home. Hello eBayers! Welcome to my auction. 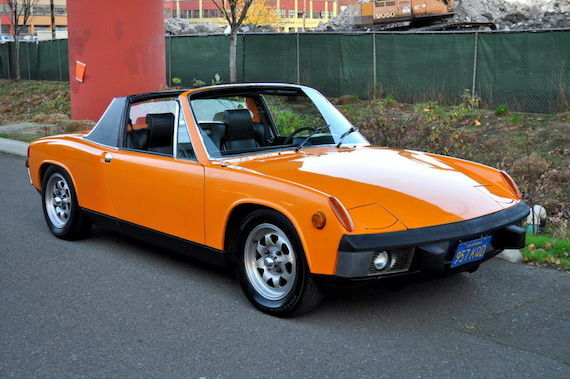 Today I have a great find for those of you interested in getting a super nice and clean RUST FREE 914 with super low original miles. I bought this car out of dry storage. It was tucked away in a clean and dry garage where it had been for many years. The previous owner had purchased the car from this Porscheâ€™s original owner with the hopes of doing a few of the mechanical fixes it needed along with some cosmetic needs. He had always wanted a Signal Orange 914. Unfortunately, life got in the way of his dreams and the car just sat. When I found the car it was not in running condition, but a total survivor. 70,450 original miles too! Factory Fuel Injection still intact. Factory engine and transmission too. The gas had gone bad and all the injectors were gummed up. The original paint had some primed areas where prior dings had been repaired, but never painted. The interior was very nice, but the driverâ€™s seat cushion was torn. Even at this stage though, I could tell that this was a fantastic find. The car was/is as dry as any I have seen. The floors are original and perfect and rust free as are the hell hole areas. The period correct Italian Murretti wheel seven had the original center caps. I wish I could find cars like this more often. 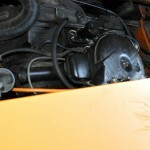 After purchasing the 914 I had it towed to my shop where we removed the gas tank, had it scoured and sealed. We then removed all the injectors and sent them out to be rebuilt. Next we went to work on the obvious. We adjusted the valves and replaced the gaskets. We also replaced the spark plugs with new oldstock 70s Bosch plugs and a distributor cap. We flushed the oil in the engine as well and filled again with Mobil One Synthetic. Once thework was complete, we installed the tank and injectors and started the car. It fired instantly and after a moment of coughing, ran like a Swiss watch. Okay, German more likely. This car hasit all. A Signal Orange finish, all the chrome accents and touches of sport that made up the appearance group, virgin door panels, and fog lights too. For the purists out there, I canâ€™t call the car a survivor because I had to do some paintwork to the car but this car was not restored. It has always been super nice and loved. The factory color is Signal Orange (L20E) and although a partial repaint, the work is excellent and in the exact proper factory shade. I had the work done by a shop that has always done the best work and this car is no exception. The work is top quality on the matching andany blends. I waxed it by hand and it is totally worthy of covered transport. I wish I could find this color more often. It is my all-time favorite color for vintage Porsches. The car is laser straight. There is no sign of previous damage or filler anywhere. This car is NOT a barn find made road worthy again. It has been cared for and garaged for its entire life, just barely driven. The hell holes are good and solid. The original floor pans are intact and they look excellent from the top and bottom. The floor is as dry as can be. The bumpers are perfect. There are no dings, dents or flaking. There is some wear andweathering on the foam rubber tops of the bumpers but nothing I would be disappointed with. 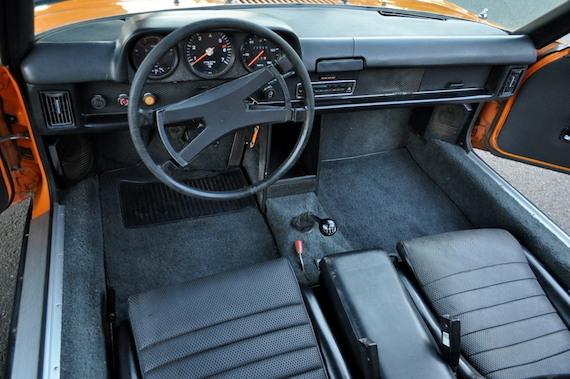 The interioris also top notch. No stains in the carpet. No rips or tears in the upholstery. No excuses at all. 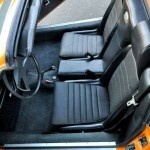 I took out the seats and photographed thefloors and they are factory perfect. The door panels are perfect and there are no cut speaker holes. The blinkers, the wipers, and brake lights and pop up headlights all work properly. The fog lights and horn are not working at this time but I will have them figured out before auction end. All the pieces are there. The top fits snuggly and is also very nice. I know this description is getting a bit long, but if you want to know more on the car please call. I speak Porsche enthusiast and I donâ€™t mind doing it. I am happy to show this car with an appointment as well. 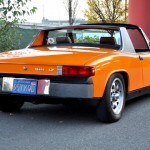 I am setting the reserve very low and I know the 914 will sell the first go around as long as we all play by these rules. #1. Only bid if you have intentions to buy. #2. Ask any and all questions before bidding. #3. Contact me BEFORE BIDDING if you have zero or negative feedback. Otherwise, I will cancel your bid first and ask questions later. Just call me if you are new. I will be happy to walk you through the process. Just be realand genuine and I will make sure that the winning bidder is happy with his orher purchase. I have 100% positive feedback and I plan on keeping that. Also, I will end the sale for the right offer so donâ€™t wait till the last second and worry about missing out. Just call me and we will work out a fair price. Also, this is a good Porsche and I love it, but there of those in the world of Porsche that will not. Please do not expect a new car here. This car is over 40 and has not been through a nut and bolt restoration. This is a driverâ€™s car. Sure, you can show it. But please be reasonable with yourexpectations if you are a perfectionist. Iâ€™m Justin my Phone number is 503-969-5127 callme anytime. I love to talk about thisPorsche. 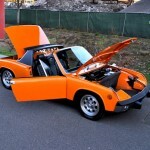 From the looks of it, this 914 is all there. 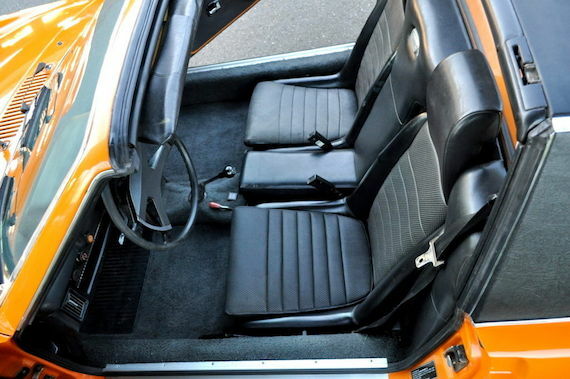 Some might deride the orange paintwork as too loud, but I love period seventies colors. The only thing I might change is the large, federally mandated bumperettes on the front of the vehicle. They mar an otherwise clean design. Since this has the 1.7 liter, not the larger 2.0 liter engine, I’d suspect you’ll probably see this car sell between $15,000 and $20,000. Thereâ€™s been a fair amount of bidding interest so far so weâ€™ll see if the reserve is reached. Tagged 1973, 914, air cooled, Porsche.